World of Warcraft is added two more mounts with the upcoming patch 5.4.8. They're two of the strangest steeds the game has ever seen. 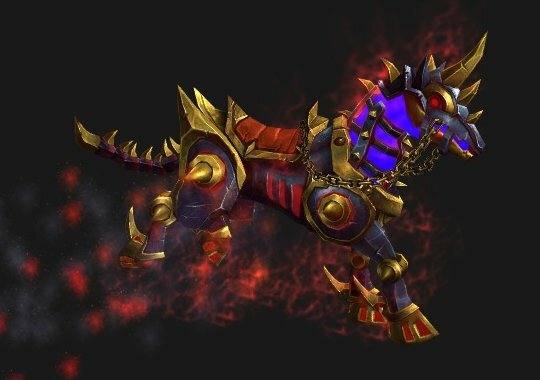 Patch 5.4.8 will also introduce an item called the Nightmarish Hitching Post. This item essentially allows the Warforged Nightmare owner to share the mount with friends. Everyone who clicks the post will see their mount transformed into a Warforged Nightmare for 20 minutes. The Grinning Reaver looks a little like a Silithid Reaver from Ahn'Qiraj. Giant bugs are creepy enough as-is but Blizzard decided to add a demon skull to this mount. It's as though Diablo mated with a Qiraji Battle Tank. Wonder what kind of back-story Blizzard cooked up for the mount, if any. Each mount has special visual effects during flight. Two wings sprout from the Grinning Reaver's back. The Warforged Nightmare leaves a red trailer of energy lingering in the air. Don't get too attached to this eye candy, though. Blizzard won't allow players to fly in the upcoming expansion Warlords of Draenor. How do you get these mounts? Well, patch 5.4.8 doesn't add any new dungeons or other content where players could conceivably earn them. It's more likely, then, that the mounts will be sold through the Battle.net Shop. The digital store currently sells seven World of Warcraft mounts, including the Heart of the Aspects and the Winged Guardian. If Blizzard plans to sell these new mounts for $25 a pop, the Nightmarish Hitching Post makes more sense. That item is like a free trial for the Warforged Nightmare. "Want to keep your temporary Warforged Nightmare? Purchase it now!" Diabolical.